With the introduction of Captain Marvel into an already crowded field, the MCU has become unbalanced. Ordinary villains might as well give up and conventional heroes can retire. For decades, Warner Brothers/DC has had trouble figuring out how to create absorbing stories with the company's most iconic figure, Superman. The problem is obvious: nothing is more boring than a character so overpowered that plot contrivances like Kryptonite are needed to create vulnerability and allow conflict. One of the great benefits of the MCU is that, at least to this point, the filmmakers haven't been trapped by a god-like superhero - until now. Meet Captain Marvel. Captain Marvel, coming only a year after the fantastic Black Panther, is a disappointment. The acting and special effects are solid but the writing, by co-directors Anna Boden & Ryan Fleck (elevated from the indie productions where they made their mark) with an assist from Geneva Robertson-Dworet, is lazy. This plays like the kind of generic comic book movie that was in vogue 15 years ago. It's high on stale, low-tension action, giving us lots of obligatory fights and chases while never providing the "stakes" necessary to make the characters and their story compelling. It's the action movie equivalent of "busy work." 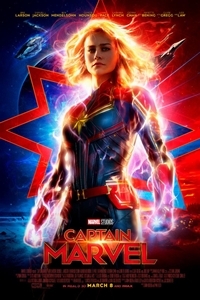 Unlike Wonder Woman (the most obvious point of comparison), which offered a rich, well-thought out backstory and an interesting mythology, Captain Marvel relies on confusing exposition and a scattershot method of universe building that's not adequate to the task at hand. Captain Marvel opens in outer space, where we're given a quick primer on the Kree/Skrull war, a conflict between the peace-loving, heroic Kree and the villainous, shape-shifting Skrulls. The title character, although not Kree by birth, is fighting on the Kree side along with Yon-Rogg and his team. Her fists can launch explosive bursts of energy but she has been taught to use their power only in extreme circumstances. She has no memory prior to her arrival on the Kree homeworld six years ago but dreams offer her glimpses of her past. After escaping a Skrull trap, Carol comes to Earth, where she meets Nick Fury, rediscovers things about the person she was, learns clues about her destiny, and uncovers hidden truths about the war in which she has been embroiled. In the process, she finds an ally in one she called an enemy (Ben Mendelsohn) and a possible enemy in one she called an ally. Movies like Wonder Woman and Black Panther work because, in addition to remaining true to the tropes and demands of the genre, they expand the canvas to create something new and artistically satisfying. Although Captain Marvel strives for this, the creative impulses underlying the film aren't sufficiently anchored to realize the ambition. The film is being touted as the first MCU entry to feature a lead female character but that overdue groundbreaking effort isn't enough in and of itself to elevate Captain Marvel to the upper echelon of superhero films. The Kree/Skrull war is one of the classic Marvel comics storylines; its introduction here is haphazard and less effectively realized than one might expect from something so deeply embedded in Marvel lore. Although the movie might have benefitted from a more detailed exploration of the conflict, time constraints allow for no more than a quick overview. Captain Marvel always seems to be rushing from one set piece to the next, trying to cram too much story into two hours. Characters suffer as a result - Yon-Rogg is one-dimensional, the members of his team have little definition beyond their physical characteristics, and Maria's introduction is perfunctory. The best parts of Captain Marvel are the bookends - a touching tribute to Stan Lee to start things off and an Avengers: Endgame prologue midway through the end credits. In between, viewers will find a standard-order superhero film that checks all the boxes. Wonder Woman had heart and easily forged an emotional connection with audiences; neither is the case here, where the focus is on technical bravura, rat-a-tat-tat pacing, humorous quips, and big "moments." There's plenty of visual pizzazz and action but the movie is geared more for those interested in getting their MCU fix than being fully immersed in a unique superhero experience.